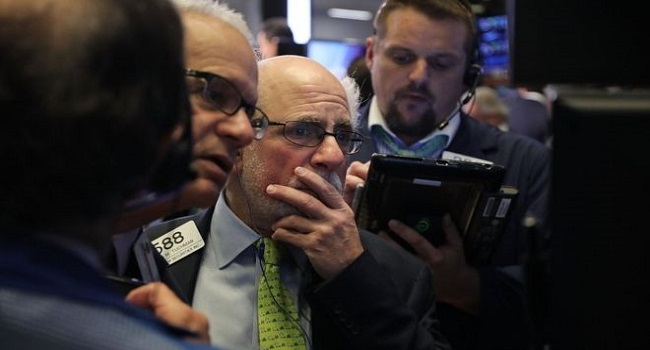 A sell-off continued among US stocks on Tuesday as investors fretted that the US-China trade war would take its toll on the technology sector. The Dow Jones Industrial Average fell as much as 500 points, while the broader S&P 500 sank into negative territory for the year to date. The tech-heavy Nasdaq index fell to its lowest level since April, with shares in Apple down another 3% to $180. In London, the FTSE 100 index slipped back below the 7,000 point level. Oil prices also tumbled on Tuesday, with Brent crude sinking $3 to $63.77 a barrel – the lowest level since March. Connor Campbell at Spreadex described the sell-off as a “macro-car crash, with Brexit fears, the post-Apec pre-G20 US-China trade war flare-up and the continuation of a nasty US tech sell-off resulting in absolute carnage”.